Today was a productive day with two lifers and other good birds. Had spent the evening in Gainesville so I could get an early start on the LaChua Trail in Payne's Prairie. But first I stopped at the location along the Gainesville-Hawthorne Trail for the much heralded Fox Sparrow. I didn't locate the sparrow, but did find Carolina Chickadee, Ruby-crowned Kinglet, Tufted Titmouse, Gray Catbird, Eastern Bluebird, Chipping Sparrow and Cardinals. But I chanced to met Andy Kratter, who has been monitoring the sparrow and keeping the feeder supplied. He shared that the sparrow had not been seen in a couple days and detailed locations along Newnan's Lake to look for good birds I was interested in. Shortly I was on the nearby LaChua Trail and was very disappointed. This location has been severely effected by a very dry winter. Much of the water had dried up, so no bitterns or ducks. Also much of the dried brush had been removed, no doubt due to fire danger. So no sparrows. On my first visit here in January of 2009 was lucky with several sparrow species including a rare-to- Florida Harris' Sparrow, Whooping Cranes, thousands of Sandhill Cranes, and Snow Geese. The green areas near the boardwalk did have a flock of Savannah Sparrows, Downy Woodpecker, Yellow-bellied Sapsucker, Northern Harrier, White-eyed Vireo and Eastern Phoebe. Lots of huge gaters were still present around the big hole. About 130 Sandhill Cranes had been seen in-flight. Did have a conversation with some fellas who were searching for the bisons. They had been entrusted to remove for relocation, a few of the bachelor males who were causing some concerns. But they were not seen in this area at the time. Before leaving the area I returned to the Fox Sparrow spot and this time was successful with the sparrow plus about a dozen Chipping Sparrows. Next stop was a couple of spots along Newnan's Lake. Had several Bald Eagles, American White Pelicans, Forsters Terns, Ring-billed Gulls, a Bonaparte's Gull, Long-billed Dowitchers, Greater Yellowlegs, Belted Kingfishers, Swamp Sparrows, Palm Warbler and Yellow-rumped Warbler. Ran into a local birder searching for the male wilson's warbler wintering here. He confirmed that rusty blackbirds can be located in the Magnolia Parke neighborhood in Gainesville. But I did not have enough time today. From Gainesville I drove to the east coast to scope for shore birds and Gulls. At Rodger Gamble State park near Flagler Beach I was able to watch a large number of Northern Gannets as they dove into the Atlantic for a meal. Made several stops along Highway 1A1 to check on any interesting birds. Did see the expected Ring-billed Gulls, Laughing Gulls, Black Skimmers, Brown Pelicans, Royal Terns, Sanderlings, Ruddy Turnstones and Willets. Reached Frank Reardon park in Daytona Beach close to dusk, were I spent some time checking through the thousands of gulls resting here. Did suceed in locating Greater and Lesser Black-backed Gulls among all the Herring, Laughing and Ring-billed Gulls. Also located a very large, basically white gull with pink legs and bill. Luckily I ran into Michael Brothers, who was birding the beach as well. Mr Brother is director of the Marine Science Center in Ponce Inlet and was the sponcer of the pelagic trip I was on back in September. He confirmed that my large gull was a second-cycle Glaucous Gull - LIFER and gave me some tips on better identifing the differnt cycles of the herring and black-backed gulls. We also spotted a Parasitic Jaeger flying in off the ocean. and across the beach. Wednesday was the start of a three day birding holiday through central Florida looking special birds not found near home. This first day was basically a travel day up to Gainesville with scheduled stops along the way. Found Canada Geese in Pasco County, dipped on the budgerigars at Hernando Beach, but easily found the Brewer's Blackbird at Jenkins Creek Park. What helped with the brewer's was a retired couple feeding the Boat-tailed Grackles, Wood Storks and the blackbird. LIFER!! Stopped at the nearby Bayport Park and added Common Loon, Horned Grebe, Palm Warblers, Ring-billed Gull and Cormorants. Could see the potiental for clapper rail, but not today. Next was a drive away from the Gulf of Mexico to Lake Apopka to refind the Say's Phoebe at Astutla. This phoebe, a western bird, has returned to this same pasture for several winter seasons now. Other birds seen at this site included Sandhill ﻿﻿Crane, Killdeers, Eastern Bluebirds, American Robins and Palm Warblers. As it was near dusk I headed over to the parking lot at the North Shore Lake Apopka Restoration Area. Last year I had a bobcat pop up here. Today just got a Great Horned Owl. Other birds sighted today included Lesser Scaup, Yellow-rumped Warblers, Red-tailed Hawk, Osprey, Limpkin, House Finch, Pied-billed Grebe and Wood Stork. Mammal of the day was a Bottle-Nosed Dolphin. Today I was contacted by Bob Pelkey and invited to join with him and several photographers participating in a photo workshop operated by a renown avian photographer Arthur Morris. 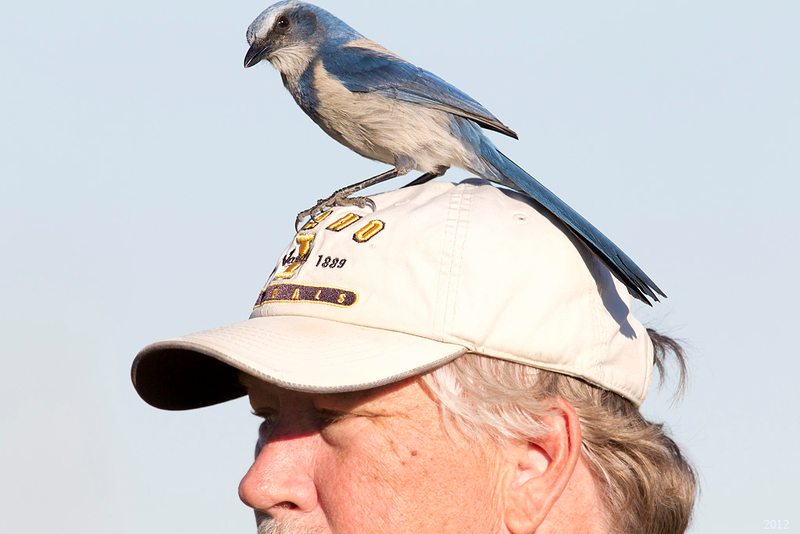 I met up with Bob and IPT group at Festival Park in north Cape Coral where they were working on techniques with photographing the very cooperative Florida Scrub-Jays. Attempts to get shots of the local Great Horned Owls, but they were uncooperative. I did enjoy my visit with these folks. One of the co-leaders was Peter Kes from Switzerland and I did enjoy reviewing his gallery. Earlier in the day, I took a few hours on a very cold ( by south Florida standards ) morning birding at Harn's Marsh. Highlights included a count of at least 15 Snail Kites. Most were hunkering down waiting for the day to warm up. American Wigeon, Mottled Duck, Blue-winged Teal, Ring-necked Duck, Pied-billed Grebe, Wood Stork, Anhinga, Great Blue Heron, Great Egret, Snowy Egret, Little Blue Heron, Tricolored Heron, Cattle Egret, Black-crowned Night-Heron, White Ibis, Glossy Ibis, Black Vulture, Turkey Vulture, Osprey, Snail Kite, Bald Eagle, Northern Harrier, American Kestrel, Common Gallinule, American Coot, Limpkin, Sandhill Crane, Killdeer, Lesser Yellowlegs, Mourning Dove, Belted Kingfisher, Red-bellied Woodpecker, Eastern Phoebe, Fish Crow, Tree Swallow, Blue-gray Gnatcatcher, American Robin, Gray Catbird, Northern Mockingbird, Palm Warbler, Yellow-throated Warbler, Savannah Sparrow, Red-winged Blackbird, Common Grackle, Boat-tailed Grackle, Great Horned Owl, Florida Scrub-Jay, Eastern Meadowlark, Loggerhead Shrike, Mourning Dove, Monk Parakeet, Burrowing Owl. Can you see the tiny Oak Toad ? I had planned on twitching after the neotropic cormorant at Wakodahatchee Wetlands in Palm Beach County, but logistics kept me closer to home. Maybe there will be an opportunity to see the bird later. So, instead I spent seven hours birding Babcock-Webb WMA in Charlotte County. I managed to find all three of the prized species here - Red-cockaded Woodpecker, Brown-headed Nuthatch and a Bachman's Sparrow. The bachman's sparrow is difficult to locate, except when the males begin singing in March. Today I had an individual pop-up in front of me as I was walking through some open pineland chasing after a mixed flock of warblers. The sparrow quickly rose and dove under a mass of palmetto. Typical bachman's behavior. Three species I was interested in finding today - bobwhite, marsh wren and brown thrasher - I dipped on, but got plenty of other good birds. I refound an American Bittern in the same location I spotted one last month. Found a lot of Gray Catbirds, House Wrens, Pied-billed Grebes, Pine Warblers, Eastern Towhees, Anhingas, American Robins, White Ibis, Belted Kingfishers and Eastern Meadowlarks. Other sightings included a juvenile Black-crowned Night-heron, Red-tailed Hawk, Red-shouldered Hawk, American Kestrel, Eastern Bluebirds , an immature Bald Eagle, Palm Warblers, Yellow-rumped Warblers, Eastern Phoebe, Northern Harrier, Tree Swallows, Loggerhead Shrike, Northern Mockingbirds, Blue Jays and Sandhill Cranes. An interesting find was a tiny oak toad. This is our smallest toad species and likes sandy pine forests in the U.S. Southeast. On the way home I swung there Cape Coral and successfully found the family of Florida Scrub-jays and Great Horned Owl near the new water treatment plant on Kismet. Also added a Burrowing Owl and a Monk Parakeet at the Pelican Boulevard ballfields. I might add that this morning, February 10th, had a pair of female Painted Buntings visit my feeder. Haven't seen buntings at my feeders for several years. You just never know what you'll find. Spent four hour at Ft DeSoto enjoying a beautiful day. A group of birders but me onto the Lark Sparrow and they had successfully sighted the rose-breasted grosbeak earlier in the day. However I was not so lucky on the grosbeak. Did observe several Common Loons and Red-breasted Mergansers off the beaches and a Horned Grebe at the East Beach turnaround. Also saw most the expected shorebirds and gulls including about 25 Red Knots. Did come across a Great Horned Owl and a small group of warblers - Pine, Palm, Northern Parula and Yellow-rumps. Had a flock of seventeen Nanday Parakeets show up at the bay pier parking lot.